This last weekend we again watched the recent J.J. Abrams Star Trek film from a couple years back. Awesome movie. I thought back to when I was an actor in Star Trek from the original series. Working with the other actors on set was life changing for me. But let’s talk about this latest movie version of the series for a minute. It is a look back to the beginning of Star Trek – a “prequel” view at how the original characters, (i.e. 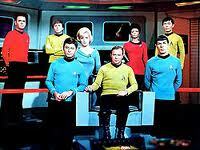 the likes of Shatner, Nimoy and Deforest Kelly) all started out; how they formed their relationships and beliefs. About why and how they go about “boldly going” so to speak. It made me think about my original days involved in Star Trek and what influence it had and has on my life today. My experience acting in Star Trek was huge. Those days on the “Trek” set shaped some very important things about me and how I act today. Maybe you could learn from it too. Star Trek wasn’t much of a hit when it originally aired late in the 60’s, but in syndication all through the 1970’s, it rocked. I have 3 brothers and we were all growing up in the 70’s. William Shatner and his crew had nothing on us; truth was, we were Star Trek. I was Capt James T. Kirk. My first officer Spock (played by my older, sci-fi book loving, overtly logical brother Kevin), was incessantly harangued by Dr. “Bones” McCoy played by Brother Paul. Paul and Kevin kind of had that relationship off set at times, so it was a good fit. My littlest brother James played the role that offers the focal lesson for today. You gotta have a bad guy sometimes. It makes it more fun. It gives you a purpose. It gives you a “mission”; a mission to succeed, to win and sometimes, to save the world. Baby brother James had a rough time of it when you think about it. He always started out as part of the “crew” (which he liked) but only for a while (which he didn’t). His role, being about 7 years old, was always to guard the ship and crew as he slowly moved from room to room. (One bedroom was the “Bridge”, the other was “SickBay” and the rest of the little house was whatever dangerous planet we beamed down to). Suddenly James (aka “The Guard…Who Went Bad”) was forced to “snap” and turn on the crew, putting our mission at risk. Racing through the house we would chase James, tackle him, and even though we had only set our phasers to “stun”, we somehow always killed him – his body blown to bits all over the living room ( somehow that was better than the “disappearing thing” that happened with the phasers on TV.) Good Times. Gotta have a bad guy sometimes. That sticks with me. I have to have a purpose occasionally, to defeat something. My guess is you might too. Maybe you work hard everyday to beat down this Guard Gone Bad sketchy economy thing. Maybe you strategize, work weekends and nights to knock this thing out and grow the business despite what seems like an incredibly hard mission. Maybe you work up a sweat by3 o’clock pounding out calls and working hard to have conversations with your customers because you are fighting this Guard Gone Bad enemy that is someone’s false perception that you “can’t” do something. Take that Guard Gone Bad; don’t tell me I can’t do something. Maybe the Guard Gone Bad for you is the competition. You won’t let “these other guys” take your market share, take your sales or take your future away from you. Nope; skip the phaser, give me the photon torpedo. Maybe the Guard Gone Bad for you is a demon you are battling inside yourself. And it would be so easy to give up and check into Sick Bay but ain’t no way that is going to happen. So maybe ( no assuredly), there is something good to be said about finding a foil, about finding that enemy to defeat and about creating and/or finding that Guard Gone Bad. Thanks to my cast mates in the original series produced in Norwood, MA in late 70’s and especially to James. Sorry you got killed so many times bro, but at least it wasn’t in vain.